Experiencing adventure, yelling "scallywag! ", and tasting the saltwater in your beard are all main attractions of the all-too-rare pirate board game. Even when a fantastic release like Merchants and Marauders sails along they tend to drag out to two or three hour grandiose affairs that can leave you exhausted and pining for shore leave. Designer Charles Ward decided to change up the ingredients for the grog with his print 'n play title Haze Islands. This is a 1-3 player small footprint adventure card game. Players sail around on a developing map that starts out diminutive and expands unpredictably. Exploration, raiding, and evading a nebulous monster called the Doom are all part and parcel to this wild excursion. 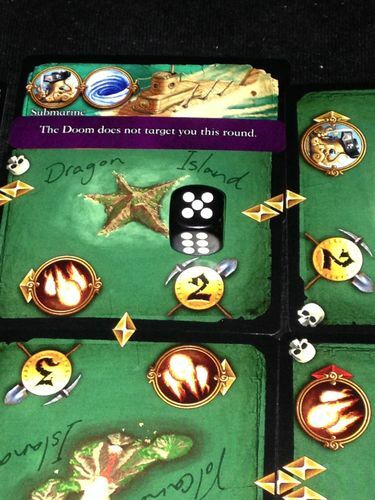 You start on a card drawn from the map deck along with a random adventure attached to the location. 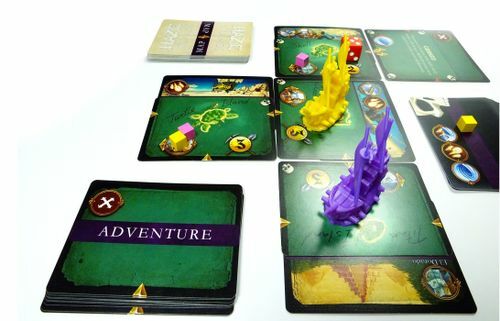 Before the game can progress everyone "oohs" and "aahs" over the serene artwork, admiring the highly saturated colors and crisp presentation. Even One-eyed Willie could appreciate the visuals and he's just a skeleton sporting an eye patch. The core engine that fuels the action ecology is a very interesting game of deck management. Yes not hand, but deck. The first player receives the entire map deck and gives just a single face down card to each other player. Each map card can be used in multiple ways--as currency when burned from the deck, as a symbol in your hand to pay a cost, or as an element of the developing board to further explore. This multi-use card system in combination with the unique action economy is quite compelling. You perform a single action on your turn which comes at the cost of discarding cards from your personal deck. So Ben as the first player drops off one of his crew members and places a cube on the nearby island of his ship’s current location. This costs a card off the top of his deck which is passed to the next player clockwise, Jeremy. Then Jeremy explores and draws that top card that was just passed to add to the current map, placing it adjacent to his ship's current locale. Aaron as the third player only possesses one card in his deck and is limited in options. He decides to sail to an adjacent space, burning his sole card and kicking it out of play. The cycle has a terminus and the map cards discarded from the final player's deck do not recycle to the first player until the following round. The goal here is to complete adventures that are attached to each location. While narrative in description and accompanied with exceptional graphic flair, it's an abstract process of discarding symbols that match the quest from your hand. You can also discard a single crew member you left on an island which possesses a matching icon. That's really the gist of the game; it's a simple core concept of sailing around and completing adventures. The goal is to have the most renown by the end of the game so you need to be efficient in your escapades and not waste time. It's definitely a race with that intriguing underlying deck economy. The card economy feels slightly like a standard deck builder such as Dominion with some key diverging points. You want to keep track of how much agency you have left in the current round and measure out your turns with the proper aggression and approach. What's unique here is that you have a large sway on your opponent's tempo by choking them of the main action resource. This subtle strategic injection makes for a relatively interesting overall play-space that's ripe for mechanical exploration. There are a few opportunities to interfere with the other players beyond tempo manipulation downstream. This dovetails precisely into the fact that this game feels like a very simple distillation of many other pirate games, at least in terms of the thematic opportunities awarded. You do a bit of sailing, maybe some pirating, possibly harass an opponent, all in the name of fortune and glory. It hits all of the high points in a simple and elegant manner. This approximation works and the feel is pretty spot on for a game of limited physical scope. The big wrinkle in the design is that aforementioned amorphous Doom. Whether it's a flamboyant undead pirate seeking revenge, or maybe even a giant squid yelling "wgah'nagl fhtagn", the Doom is full of hate and it's coming like a giant ball of death. The Doom is coming and Cryptozoic isn't here to save your pledge this time. Represented by a die, the Doom grows in strength each turn. The face is rotated to the next largest number which represents its power. It drives towards the closest player with gusto, leaving torn limbs and fractured hulls in its wake. You can combat the Doom--again, by spending sets of symbols--but more likely you’ll want to run. There's no shame in being a cowardly pirate that feeds off the weak. You're remembered by the tales that are told, not the truth that lacks witness. This nuance of keeping that malicious entity in your rearview mirror and putting blue sea between you while still trying to best accomplish your goals, that's the game. Power that with the slick card engine and you have a compelling small footprint strategy game that is easy to break out and quick to resolve. The main drawbacks to such a design are the puzzly nature and fiddliness. The overarching strategy is a matter of sorting through multiple options teasing out the most efficient ways to gain reputation. Working your way through the best path feels like a microcosm of something like Mage Knight. It's not nearly as brain burning or irksome, but it is very much: "So I could move there, then do that, or I could stay here and drop a crew member off before heading that other way. Yeah, but that puts me closer to the Doom and I don't have enough cards left in my deck to make it far enough away later. Ugh." The main cause of this is due to how clear your options are on the board. Adventures don’t have unexpected twists and chaotic events don’t fire off between rounds. Besides the other players and that core deck engine, much is somewhat predictable. That's not a huge criticism; rather it's a comment on the specific style. This quality also makes it a rather satisfying solo game as it plays pretty much identical to the full complement, with the added caveat that you have to defeat the Doom before the game ends and achieve a minimum score. This is definitely an enjoyable way to play and doesn't feel tacked on. The second aspect to be aware of is the fiddly nature of the card constructed play area. Laying out map cards adjacent to each other to form the boundaries is not the problem; rather it's the adventure cards. These get tucked under each sea area to show only part of the component's face. At the end of the round, any unclaimed adventure cards are rotated from a two-icon side to a one-icon facing. This means they become less valuable but also easier to accomplish. Single icon adventures are flipped entirely over causing that sea zone to become an adventure dead space. Mechanically it's very solid and plays well to make the board feel more dynamic and lively. However, physically rotating those cards each round upsets the adjacent pieces of map and causes a bit of shuffling and re-ordering. This isn't a deal-breaker by any means, but it's a consternation that's a limitation of the format and mechanisms. Yet despite this fiddliness the joy still comes through. 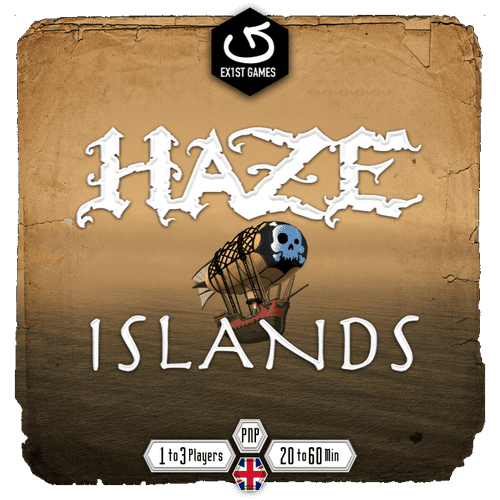 Haze Islands, as a package, provides for an interesting puzzle with a sense of adventure heightened by a wicked formless villain. This is the type of design that surprises with its clever execution and engaging mechanisms. It's a small card game I'm eager to return to and one which is absolutely worth the ink and effort to dive in. This review was originally written for Ding & Dent. If you want to check out more of my reviews, you can find all of my work at this Geeklist. Thanks again for reviewing the game Charlie. I just want to follow up with 3 pressing announcements. Please nominate HAZE ISLANDS for the Print & Play category. Just being nominated would help take this game to the next level. We are giving away professionally printed prototype copies of the game. All you have to do to enter is like the EX1ST GAMES Facebook page or subscribe to our website. Do both and you will have a better chance of winning. As is our policy, this game will be FREE FOR EVER. You can grab the cards and rules files from the game entry. Yes, over 2000 downloads so far. What are the links to your FB page and website? Not sure I'm allowed to post link to a giveaway contest outside of BGG, so I will ask you to search for "EX1ST GAMES" on facebook. Sorry, hope you find us there. Thanks for asking. Haze Island and many other great PNP games are looking for more green thumbs. Please help put Haze Islands in the Hall of Fame. Thanks!